Star Wars: Complete Locations by Jason Fry came out this week from DK Books. Del Rey has also released the Thrawn Trilogy with the new covers. Be wary of ordering online as the ISBN numbers are the same. 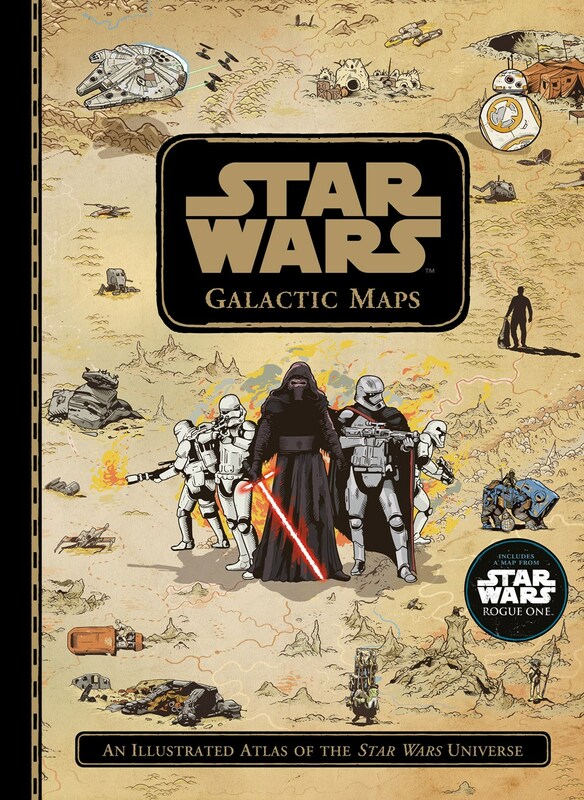 Star Wars Galactic Maps has a new cover. Author John Jackson Miller has launched his new webstore which includes signed books. If you’re looking for live Force Friday coverage, check out Jedi News. They’re going all out. Sci-Fi Family Day is October 1 in Milwaukee, WI. Star Wars guests include artist Dave Dorman. The Texas Teen Book Festival is October 1 in Austin, TX. Star Wars guests include author E. K. Johnston. Dave Dorman Day is October 2 in Whitefish Bay, WI at Mathnasium. The Star Wars guests is of course artist Dave Dorman. Graffiti in the Margins is October 3 in Clinton, ON at the Clinton Public Library. Star Wars guests include author E. K. Johnston. Kevin Hearne is doing a signing for The Purloined Poodle at The Poisoned Pen in Scottsdale, AZ on October 3 at 7:00 PM. New York Comic Con is October 6 to 9 in New York City, NY. Star Wars guests include authors Chuck Wendig, Pablo Hidalgo (DK Booth), Jason Fry (DK Booth), Kerrie Dougherty (DK Booth), actress Carrie Fisher, artists Mark Brooks, Katie Cook, Dave Dorman, Adi Granov, Alex Maleev and comic writer Charles Soule. Indie Author Day is October 8 in Dallas, TX at the Dallas Public Library. Star Wars guests include author Martha Wells. Hal-Con is November 4 to 6 in Halifax, Nova Scotia. Star Wars guests include authorKevin Hearne. The Gala Strikes Back fundraiser at Rancho Obi-Wan in Petaluma, California is November 5th. Tickets are available now. Midwest Comic Con is November 5 to 6 in Des Moines, IA. Star Wars guests include artist Dave Dorman and actor Christian J. Simpson. Star Wars Identities is heading to London and will be there from November 18, 2016 to September 3, 2017. And The Star Wars After Show. Star Wars Go Rogue comes to an end with Chapter 4. DragonConTV has an interview with author Timothy Zahn. CBS 58 posted their full interview with author John Jackson Miller. Paulsemel.com has an interview with Halo authors Christie Golden, Troy Dennig and Matt Forbeck. Paolini has an interview with author Kevin J. Anderson. With the return of Star Wars Rebels we have the return of Rebels Recon, and the latest episode guide. This one looks funny, True Memoirs of an International Assassin. It’ll be out November 11th. Today is Force Friday and one of the best toy guides I’ve seen is from Yakface.com which has an awesome checklist. Sideshow Collectibles is offering free shipping on select Star Wars items. They also have pre-orders up for the Hot Toys sixth scale Stormtrooper Jedha Patrol, Shoretrooper, Darth Vader and the sixth scale Sideshow TIE Pilot. You can check out all their Rogue One items here. Gentle Giant has pre-orders up for the Jyn Erso mini bust. If you’re a premier guild member, you can also pre-order the Ugnaught 2-pack. Barnes & Noble is getting an exclusive R2-Q2 ARTFX statue this November and a Kotobukiya R-3PO. If you live near Disney World or Disneyland, you can pick up the following Rogue One merch. S.H. Figuarts has updated their Star Wars figure listings.